The road to the Boston Major begins with new quests, items and more. Dota 2's latest Battle Pass has arrived, reintroducing daily and weekly challenges, weekend Battle Cups, match wagering, new cosmetics, particle effects and terrain. If that all sounds rather similar to the International Battle Pass, which concluded in late August, then, well—it is. Except it's green. This is Valve's least experimental Battle Pass to date, which isn't necessarily a bad thing. After years of tinkering with different ways to make an event out of the game's annual esports circuit, the sticker-book guessing game that was the old Compendium has transformed into a multi-faceted enhancement of the game's basic features. During Battle Pass months Dota is flat-out better: there's more to do, more ways to compete with your friends, and more rewards to earn. That $7.99/£5.99 entry fee is starting to look more and more like a seasonal subscription to the 'full' game. The biggest change this time around is rather subtle, and will only affect a tiny minority of players. Top-tier Dota teams that win Battle Cup events will gain access to an exclusive Champions Cup at the end of the season. Winning this will, in turn, grant them access to the Spring Major Battle Cup Qualifiers, and then they'll get to go to the Spring Major Regional Qualifiers. It's a long road, but hey—you've now got the opportunity to qualify for a $3m Dota 2 tournament through the game client. 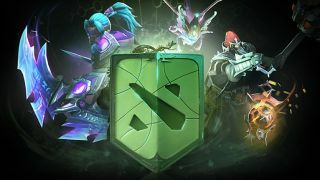 Accompanying the Battle Pass is an overhaul of Dota 2's new player experience, folding the existing tutorials into a seamless experience accessed through the 'Learn' tag. There's also a new 'Items' page that allows you to browse every item in the game with expanded descriptions of stats and effects. This is really good stuff, explicating a lot of things that many players rely on word-of-mouth to learn—for example, the invulnerability window granted by Manta Style. Many items have also been updated with flavour text, with a few standout gags. The Enchanted Mango is, we're told, 'irresistible to amphibians'—mysterious Dota designer Icefrog is reportedly fond of the fruit. Town Portal Scrolls are now described as 'what a hero truly needs'—answering a question raised in Dota 2's very first trailer. What does a hero truly need? A Town Portal Scroll. Buy a Town Portal Scroll. Why don't you have a Town Portal Scroll? Finally, the minimap has been updated with icons helping new players locate the Side Shops and Secret Shops. As part of the game's broader push towards accessibility, this is very welcome—but.... hang on a second. Take a closer look at that Secret Shop icon. Okay. Interesting. Computer, flip it.